Heat the oil in wide-bottomed pot set over medium-high heat. Add the onions and chorizo and cook for 3 to 4 minutes. Add the garlic and cook 1 minute more. Add the wine and bring to a simmer. Add the mussels, cover, and cook just until they open. Sprinkle with salt, pepper, the chopped tomato and the fresh basil. 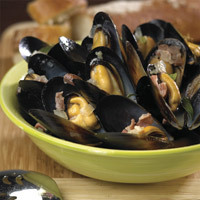 Divide the mussels and cooking liquid among bowls and serve.